When space in your garage is at a premium, you don’t want to waste what valuable floor space you have for storing your bikes. You don’t have to worry about your bikes cluttering your garage any more because the gravity bike stand is going to make your storage requirements go vertical. No more trying to squeeze between your bikes and car any more because with this bike stand, you’ll be employing one of the most effective organizational techniques to bring order to chaos. It is human nature to simply store things on flat surfaces wherever there is space. Why does your desk get cluttered? Because there is horizontal free space to lay down whatever you want on it. It’s easy and convenient. Why not establish a storage mechanism that’s just as easy and convenient and also takes advantage of the vertical space in your room? By deploying a freestanding vertical bike rack you are doing just that. You’re lifting the bikes off the ground, and storing them vertically, one on top of the other. This maximizes the efficient use of your space. I’ve been trying to clean and organize my garage so that both cars can fit. This is the most space effective method I could find for two bikes. This vertical bike storage system comes with independent adjustment arms so that your bikes are hanging level thereby maximizing the stability of the system. The unit has a vinyl coating on it in order to protect your bikes from unwanted scratches and scuff marks. In order to endure heavy usage requirements, the rack is coated with a black epoxy finish. This particular unit is very easy to set up as there are no bolts, screws or fasteners required, and weighing in at a mere 20 pounds, it should be no problems moving the unit around to different places in your storage room. The base of the rack is 27 inches wide and extends approximately 21 inches from the wall. The overall unit height is 82 inches. It is recommended that you don’t exceed the weight limit of 33 lbs. per bike or a total of 77 pounds on the entire unit. Does all that it should do. Great quality, great design. If you need to store 2 bikes in a little space, this one will do it. 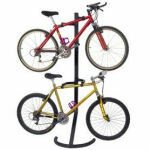 Another nice feature of the vertical bike storage unit is that it includes a mounting screw for optional wall mounting. The unit is vertical and can be used as a free standing rack in the middle of the room, but another option you have with this rack is to use the mounting screw to affix the rack to a wall. It’s quick and easy – a single bolt to screw in. By using it, you achieve two goals. One is that you increase the overall stability of the unit. Having it mounted to the wall will ensure that you cannot upset the bike rack’s center of gravity, but more importantly you ensure that the rack is as far out of the way as possible. The device is built to store your bikes compactly, but if it’s encroaching on walkways by sitting out a foot from the wall, that is wasted space. Push the rack against the wall and it is completely out of the way, the walkways are cleared, and you’re left with a safe, secure, and compact bike storage unit. This stand is great. Stable, compact and secure. We can fit it in between our cars in the garage with plenty of space. The kids can get their bikes off of it with no problem. I am getting another one.